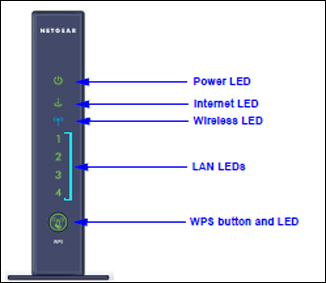 A link to "Netgear N300 Wireless Router overview" will be sent via email. 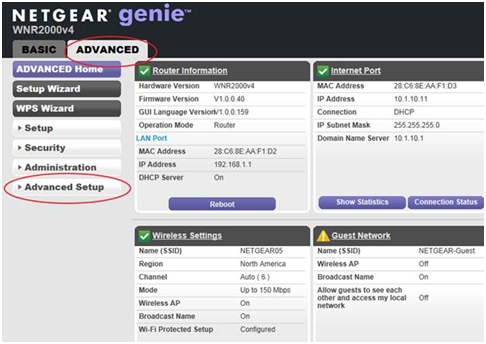 Your link to 'Netgear N300 Wireless Router overview' has been sent! Comcast Business recognizes that customers increasingly demand a secure and private WiFi solution to satisfy the business’ internal wireless networking needs. To meet this need, Comcast Business offers a Netgear N300 Wireless Router (Model No. WNR2000) that can be connected to your Comcast Business Internet Gateway. Power • Solid amber - The unit is starting up after being powered on. • Solid green - The power is on, and the router is ready. • Blinking amber - A firmware update is in progress. • Blinking green - The firmware is corrupt. • Off - Power is not supplied to the router. Internet • Solid amber - The IP address has not been acquired. • Solid green - An IP address has been received; ready to transmit data. 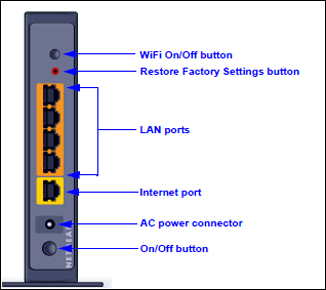 • Off - No ethernet cable is connected between the router and the modem. Wireless • Solid blue - The wireless radio is operating. • Off - The wireless radio is off. LAN ports 1-4 • Solid green - The LAN port has detected a 100 Mbps link with an attached device. • Solid amber - The LAN port has detected a 10 Mbps link with an attached device. • Off - No link is detected on the LAN port. WPS • Solid green - Indicates that wireless security is enabled. • Blinking green - The router is attempting to use WPS to add a wireless device or computer to the wireless network. • Blinking green rapidly for about 5 seconds - WPS has failed to add a wireless device or computer. • Blinking green rapidly and continuously - The router is stuck in the temporary AP setup locked state. 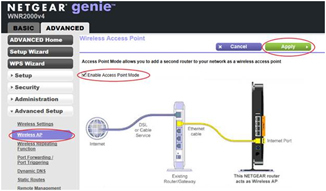 • Off - No WPS connection exists. WiFi On/Off button Turns the wireless radio in the router on or off. Restore Factory Settings button Press and hold this button for about 7 seconds to reset the router to its factory default settings. LAN ports Four local area network (LAN) 10/100 Mbps Ethernet ports for connecting. Internet port Ethernet port for connecting the router to a cable broadband modem or DSL broadband modem. The Internet port is also referred to as the WAN port. AC power connector AC power connector to connect the power adapter to the router. Power On/Off button Turns the router on or off. The label on the back panel of the router shows the default login information, default WiFi network name (SSID), network key (also referred to as wireless network password or passphrase), serial number, MAC address and other information. 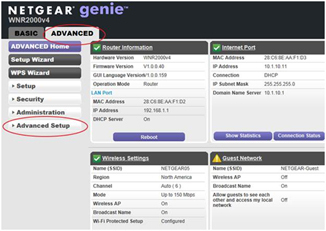 The Netgear wireless router can be set up in one of two ways: AP mode or NAT over NAT. Network printers previously installed on a computer will continue to work. If attempting to add a new network printer on a wireless computer, the printer will be discoverable. NAT over NAT provides a simple solution to get to the internet for employees. It does not grant seamless access to the business' internal network. If factory reset, the device will default to NAT over NAT. Will no longer be available as mapped network drives. The resource will be available by IP address, but not by hostname. If attempting to add a new network printer on a wireless computer, the printer will not be discoverable. This is considered a private network in that it is separate from the Xfinity WiFi hotspot. This will not provide a seamless network as there will be two separate IP ranges. SSID Name Preset. See router label. Network key (passphrase) Preset. See router label. Can I change the router login username to something other than "admin"? No, the router login username cannot be changed. Note: You can usually find the login URL on a sticker on the bottom or back of the router. Log into your router and select Advanced, then select the Administration section on the left-hand menu. Select Set Password, then enter the old and new password, then confirm the new password. Select the Apply button to save your change. From the left-hand menu, select Wireless Settings from the Set Up section. In the Name (SSID) field, enter the network name you want to use. Under Security Options, select a security encryption level. WPA-PSK + WPA2-PSK offers the best protection. In the Passphrase field, enter your chosen network password. Select the Apply button to save your changes. How do I change or reset my wireless network password? Log into your router using the "How do I log into my router?" instructions above. From the left-hand menu, select Wireless Settings from the Set Up section. Enter a new wireless network password into the Passphrase field under your security selection and select the Apply button to save your changes. How do I set up an unsecured or open wireless network? (or) How do I remove the wireless network password so anyone can access my network? Note: Removing the wireless network password will leave your network unsecured and vulnerable to users with malicious intent. It is not recommend to leave your network unsecured; you do so at your own risk. To reset your router to factory defaults, use a pen or paperclip to press and hold the Reset button for approximately 10 seconds until the Test light blinks. Release the button and wait for the router to reboot. Factory-resetting the router will remove all custom settings that may have been configured on the device, including AP mode. Any number of devices can be connected wirelessly to the router; however, performance might noticeably decrease with each additional device. Three to five devices should be able to use the same wireless connection without a noticeable decrease in network responsiveness. How does Live Parental Controls powered by OpenDNS work? Live Parental Controls powered by OpenDNS allows you to filter web content. You can block more than 50 different categories of sites for everyone connected to the Internet through your Netgear router or customize blocking for individuals.